Poet Jeff Walt: That gloomy, quiet distance couples often devolve into: frozen, caustic, witch-face—it envelops this couple in the dim space they inhabit together. Artist Cheryl Gross: It’s dark. I am drawn to dark and spooky things. More fun to illustrate. More of a challenge. Poet Jeff Walt: Yes, I can see the room. And beyond. I feel mired with the couple as they sink deeper into melancholy and hate. The visual adds a sense of filth, sordidness and plumb grime: what I call “toxic love squalor”—I can almost smell the moldy tension. Artist Cheryl Gross: I usually follow what the writer is trying to say, or what I think they are trying to say. The design and color comes later. I must have been channeling Dr. Seuss while I was creating for this piece. My characters do look kind of Dr. Seuss-like…on crack. Poet Jeff Walt: Ironically, the wrinkled, hideous faces, which evoke unspoken vitriol were the most surprising. The dark colors, too, give it a bruised feel. Artist Cheryl Gross: How well they fit together. I love the layout. Poet Jeff Walt: I admire ekphrastic poems—a great writing exercise tool. And, yes, I saw a piece at the Denver Art Museum called “Rolling His Own”; “The New Utopia” is another. If the title and the image stay in my mind, stay on repeat, then they get written. They have to get out of my system—that’s how the ekphrastic poem process works for me in my writing world. What was that experience like for you? Why were you inspired to do so? 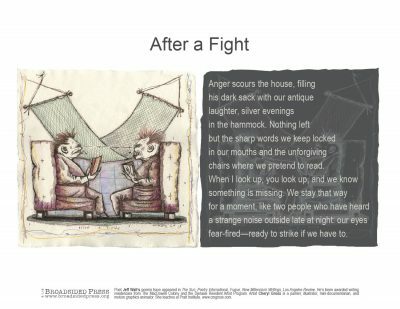 Poet Jeff Walt: I loooove broadsides! I collect them. I was a finalist a couple times with Littoral Press who does excellent, inspiring broadsides—so close! My finalist spot (three different years) won me signed broadsides by Sharon Olds, Dean Young, and W.S. Merwin. If my house caught fire, I would grab the broadsides before snatching up my computer. Artist Cheryl Gross: My work is very narrative. Always telling a story of some kind. It’s a nice break to assist/illustrate someone else’s story. Poet Jeff Walt: Leonard Cohen on repeat. Poet Jeff Walt: Addonizio’s Mortal Trash just arrived today (yeah! ), and I am eagerly awaiting Jeannine Hall Gailey’s Field Guide to the End of the World. I’m always re-reading Steve Kowit who I worked with during the last year of his life in a local San Diego workshop. I just read Sad Math by Sarah Freligh and am still smiling from the power of her work. Ron Salisbury’s book, Miss Desert Inn, from Main Street Rag, is on my shelf awaiting a read. Artist Cheryl Gross: Sin City series. Poet Jeff Walt: Oh, my, yes! I discovered Bruce New’s photomontage/collages; his work is what I would like to see on the cover of my unpublished manuscript, HEX. Also, here in San Diego, my local obsession is Peter J. Geise with his visionary outsider art worthy of Raw Vision. From Vermont, Jolene Granzha’s collages, paintings and intaglio prints inspire. Alan Leitner on O’ahu gets me purring, too. A piece by each hangs in my studio. Artist Cheryl Gross: Cindy Sherman’s new body of work at Metro Pictures. Jeff Walt’s chapbook, Soot, was awarded co-winner of the Keystone Chapbook Prize and published in 2010 by Seven Kitchens Press. His poems have appeared in Alligator Juniper, The Good Men Project, Cream City Review, and The Ledge. He won the 2014 Red Hen Poetry Contest judged by William Trowbridge. Several poems from Soot were selected and scored by composer David Sisco and were performed at Carnegie Hall. www.jeffwalt.com. Jeff Walt has had a thirst for writing poems since he was a child. Here he is vectorizing throughout Balboa Park in sunny San Diego with his partner in crime, Phil Farabaugh (photographer). Artist Cheryl Gross lovingly vectorizes a colleague.